Students were judged on their ability to utilize negotiation and mediation skills and strategies to successfully negotiate or mediate a settlement that best serves the needs of the parties. Each team gathered in rooms across the Wirtschaft’s Universität campus attempting to resolve a dispute regarding a faulty order of chocolate cake. Under the watchful eyes of 3 mediation and negotiation experts judging the process, each team discussed reputational damages, disastrous impacts, emotional costs, company values, and so on. 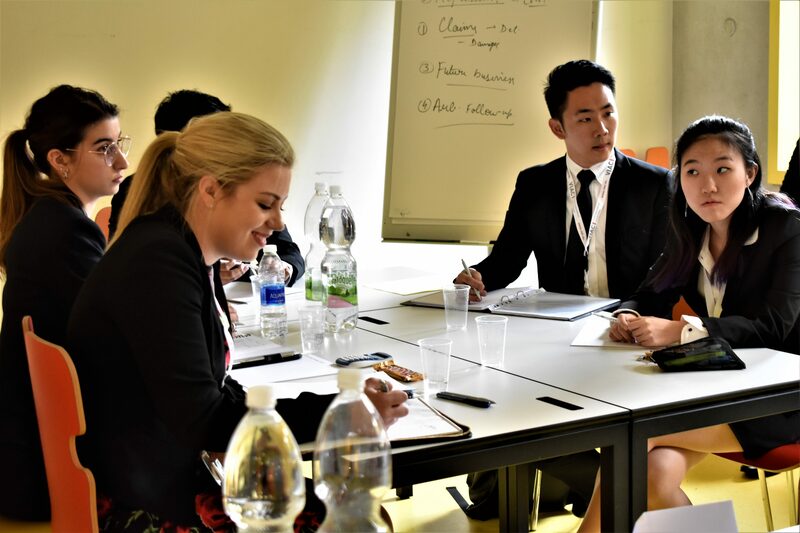 Alongside the panel of expert judges, each session includes three competing groups: two universities on each side of the case and one university acting as the mediator. The day was filled with preliminary rounds, which continue until tomorrow. Afterwards, finalists will be announced and the quarter finals will begin. The day finished with a wonderful traditional Austrian dinner at the Schweizerhaus Beer Garden, where students relaxed after a long but exciting day. Written by Nicklas Boehm and Ruxandra Gheorghe. Nicklas and Ruxandra are both interns at IMI and are attending the CDRC in Vienna as IMI representatives, providing daily coverage of the event.